TC Group’s install, tour and residential brands – Tannoy, Lab.gruppen and Lake – will once again be bringing their extensive range of install and performance audio products to ISE 2015 in February, with Tannoy leading the charge with a host of brand new product offerings. Making their debut will be two brand new additions to Tannoy’s award-winning digital beam steering column array system. Tannoy has developed the new QFlex Life Safety (LS) models as a cost effective solution for critical, life safety applications, a solution that balances complex power consumption needs with the high performance and intelligibility that is the core of the proven QFlex range. Based on Tannoy’s superior knowledge and heritage of speech intelligibility in critical listening in difficult acoustic environments, the new models have an optimised driver placement and improved current draw, making them perfect for applications where emergency voice alarms or communications may be required. The QFlex LS will also herald an integrated showing of Tannoy’s life safety and EN54 certified products, such as the VLS passive columns and the DVS Series wall mounted series. 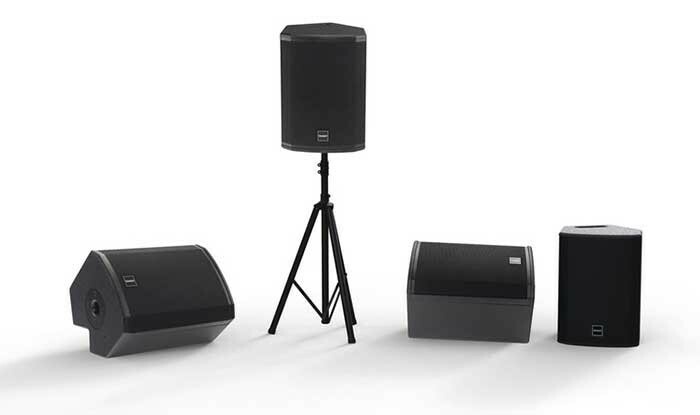 ISE 2015 will see the first public showing of Tannoy new VX 8M, a brand new full range dual concentric loudspeaker from Tannoy that provides a compact, yet punchy and sonically vibrant solution for small-to-medium scale performance sound reinforcement. With a tightly controlled 90 degree dispersion for optimum coverage and forward gain, the VX 8M has a peak output of 119dB and a recommended amplifier power of 260W, meaning this model is a powerful and versatile performer for a wide range of applications, with the new cabinet design including 40 and 60 degree angles, making the VX 8M ideal for use as a dedicated floor monitor. Another new addition to the Tannoy catalogue will be the THL-1, a large format tunnel horn loudspeaker that provides a robust, durable and highly cost-effective solution for emergency voice alarm/communication (EVAC) systems in the physically and acoustically hostile environment of road tunnels. In an application notorious for high ambient noise levels and excessive reverberation, the THL-1 transmits crisp, controlled and intelligible voice announcements throughout the space from a minimum number of loudspeaker locations. Making its first major European debut following last year’s pivotal launch will be Tannoy’s CMS 3.0, the new range of ceiling devices that feature a radical reinvention of Tannoy’s dual concentric driver design, offering wider dispersion and improved sonic clarity across the entire range. CMS 3.0 will be complemented by Lab.gruppen’s LUCIA amplifier range, which provides a matched 16ohm solution enabling 8 CMS models to be driven by each of the two channels. Another European debut will be Lab.gruppen’s D Series platform, the new install amplifier range that was based on the TEC Award winning PLM 20000Q. Offering all of its unique performance characteristics, flexibility, and raw power of that much-loved platform, the new D Series gives complete control and monitoring of the whole platform ecosystem – including networking, audio I/O, signal processing, amplifiers, power supply and connected mains supply – delivering unique operational benefits and improved system control, with the added flexibility of both Lake and Biamp Tesira variants offering a new level of integration possibilities. In addition to the professional ranges, Tannoy will once again be showcasing many of its residential products at ISE 2015, including the Prestige Gold Reference range, as well as the first public showing of the limited edition Revolution XT floor standing loudspeakers. With a range of optimised solutions Tannoy, Lab.gruppen and Lake will be in Hall 5 Stand R92.